Unlike Reaper’s lupine models, the wolfen are sculpted without a furry coat. This to me seems a bit odd, if they are wolfen they should be furry, but I have developed a way to get a much better fur effect than you would get from drybrushing sculpted fur. 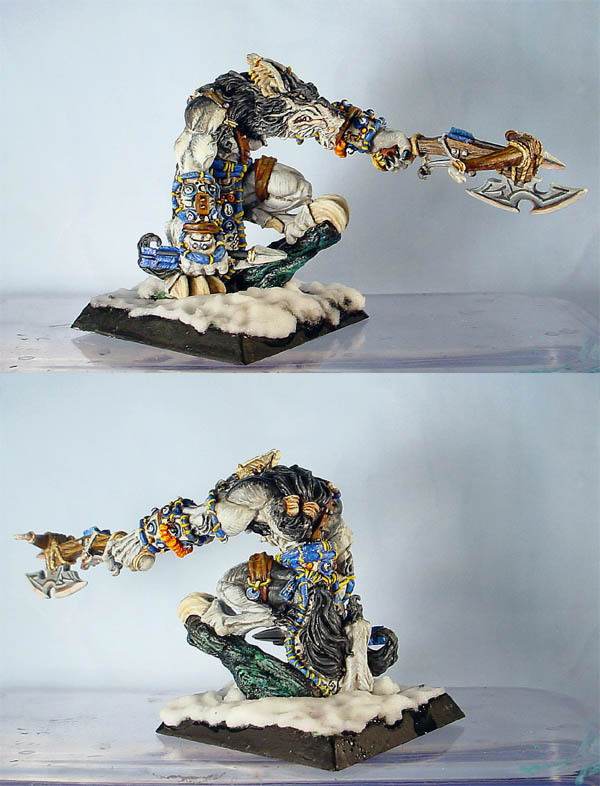 I have often been asked how I paint my wolfen to make them look like they have fur and I hope that this article will shed some light on the subject. First I decide on general colour scheme. If I'm doing a standard grey wolf I'll go for lighter shades on the belly with dark grey on the back and brown/tan round his face. Since I took some in progress shots of my Wolfen Crossbow 3, I’ll use him as a step by step guide. However, depending on the colour I want the moon puppy to be, I will either prime black (for dark wolfen) or white for paler wolfen or those with a high contrast. I’ll also be showing you some other wolfen I have painted and try and describe as best I can what colours I used on them. I used Drodo’s wolfen as inspiration for this one because when I saw his one in the CMON annual I thought it was a perfect colour scheme for this particular model. As he’s going to be mainly white on the legs and front and grey on the back I decided to prime white. 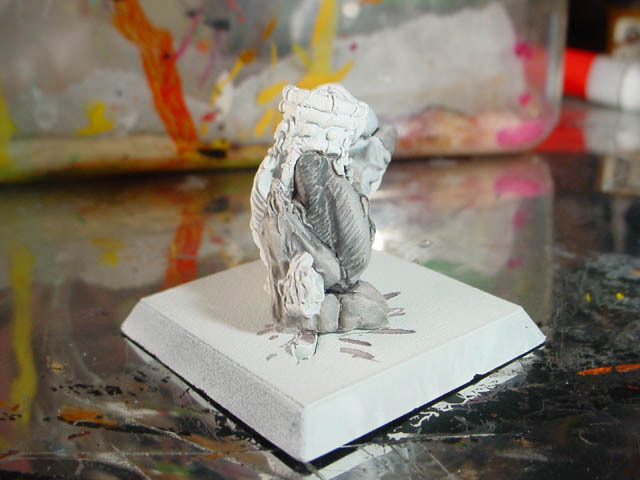 I then gave it a very thin wash of fortress grey and then a darker grey wash in the recesses. I then start with a 3-0 brush and begin to layer on the first patch of fur. 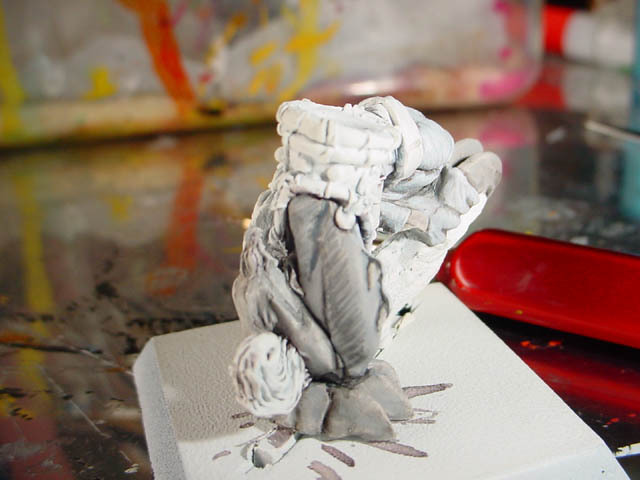 I follow the curve of the muscle, painting little strokes going in the same direction in a darker shade than the basecoat (I keep the paint thin enough so it goes on smoothly, but not so thin that it runs). I now begin to build up the layers of fur by repeating the above process and mixing up a variety of grey tones to give depth to the fur. More black is added to the recessed areas in this case. Ghostly grey and then more White is added to fortress grey mix to build up the lighter fur, which in this case is on the front and inside of the thigh and later on the lower leg and foot. The upper thigh has nearly been completed, and rough areas are then cleaned up and work started on another area of the skin. 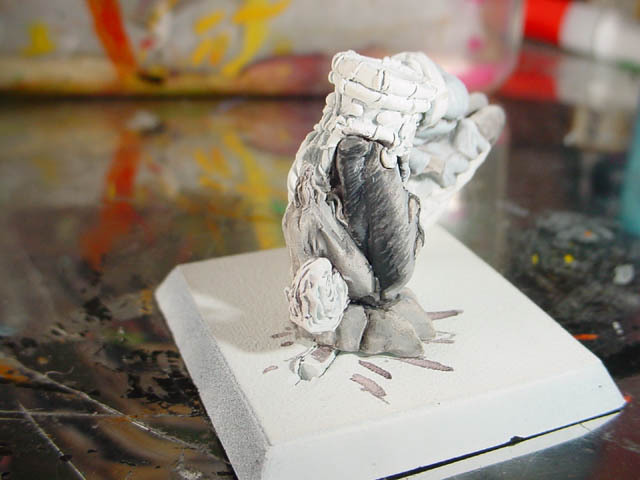 This process is repeated across the model, this picture shows the other leg, with the fur completed. 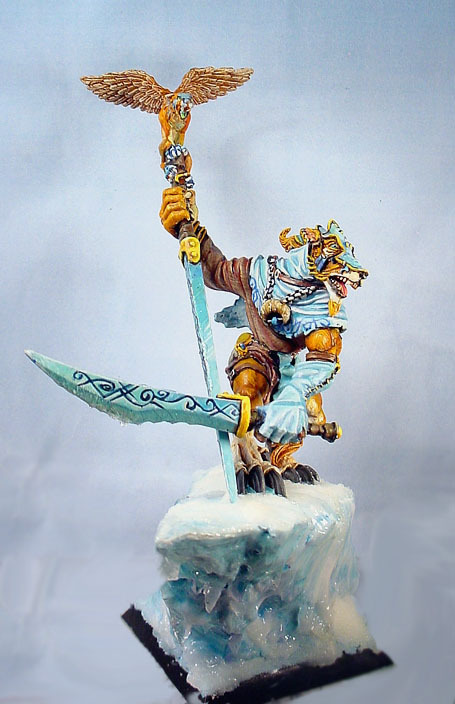 The rest of the model is painted using the fur technique and any other details have also been painted. As this article is about fur and not painting in general, I wont go into details about how I painted the armour and crossbow. 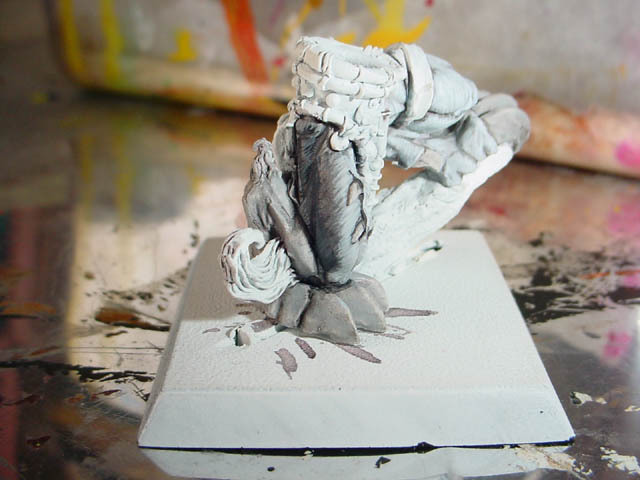 That model was painted using just greys (black, codex grey, fortress grey, ghostly grey and white) and gave him quite a cold look. For Syriak, I used warmer tones. In this case I can’t recall what basecoat I used, I think it was probably black. I then would have built up the fur using browns and tan colours (bleached bone, and beastial brown for the main colours on the front). You can see from the photo that this wolfen has a warm tan belly and a much darker grey back (codex grey/ black mixed with some of the brown tones), giving him more of the look of a real timber or grey wolf. I used a lot of different greys and brown tones to pick out the details of his face. I also used a thin was of chestnut ink to shade the recesses between his muscles. 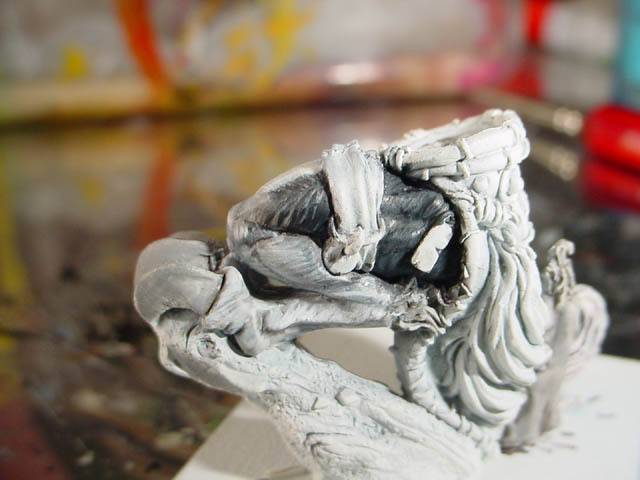 The Watcher is painted in a similar way to Syriak, but there is less contrast between the front and back of the model. Agyar was primed black and I used shadow grey and black to pick out the fur of this near-black wolf. Black is quite a difficult colour to paint a wolfen, because if you over highlight it looks too artificial but if you don’t highlight enough, you can’t see the fur. Inspiration for Saphyr came when I was in Norwich City and I saw this gorgeous husky-like dog which was very orange coloured on it's back and a light tan colour underneath. It had one blue eye and one green eye. I thought I would have to paint a wolfen like that. The orange fur went well with the orange of the Orfrai, I thought. Anyway I started with white as a basecoat, then built up the orange tones using beastial brown and snakebite leather then I built up the lighter fur underneath using graveyard earth, bleached bone and then white. I hope this gives you some idea of how I painted these models. Also, the zero comments on this article seemed like the wrong number!